lang="en-US" prefix="og: http://ogp.me/ns#"lang="en-US" prefix="og: http://ogp.me/ns#"
Marcinkowskiego 8 was constructed in 1902 complementing its surroundings of red brick buildings located at the corner of Karola Marcinkowskiego and Ludwik Pasteur’s Streets. It was erected in a different époque, when people were living their lives at a different speed, with different attitudes and declaring different values. It was an era, when people could take their time and enjoy real style and beauty. The very special spirit of those times is reflected in the building’s stylish exterior and interior. The investor was a renowned Wroclaw’s jeweler and goldsmith, J Schlossarek, whose precious masterpieces are still among collections of connoisseurs and assemblages of Lower Silesian diocese. The investor’s background explains the attention to details visible in every aspect of the building. The ornate façade makes an excellent impression on everyone seeing the building, not just for the first time. As you enter the building through the large, decorative and highly impressive hall, the view of spacious, well lit staircase and common areas with numerous decorations, beautiful, forged handrails and original tiles make the feeling of a journey through time even stronger. The apartments contain numerous solutions intended to improve the quality of life of their residents. 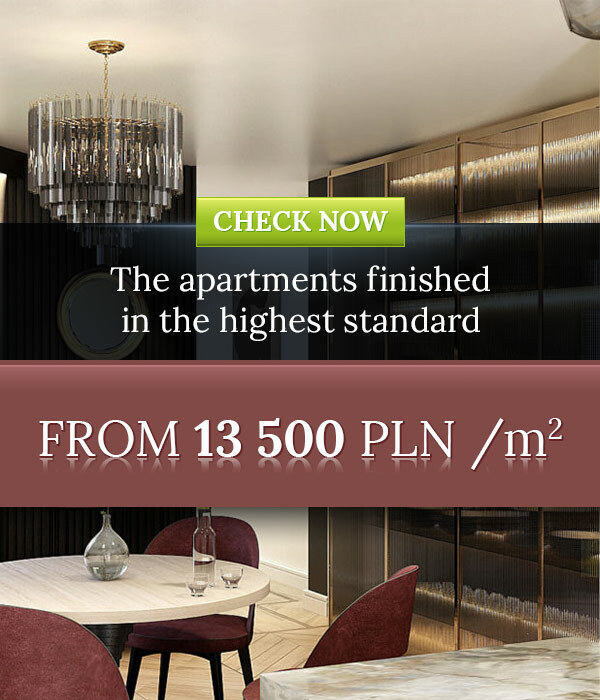 Wooden windows, replicating the original design, give a spectacular view on to one of the most peaceful and calm urban districts of Wroclaw and provide ample natural daylight. High ceilings and logically planned layouts underline the feel of spacious, well lit rooms. The amount of historical decorative details in the apartments and common areas strengthens the feel of a historical building and enable the creation of exceptional interiors with the mix of old and modern elements. Most of the existing old buildings do not have insulation of the foundation walls or their insulation coating is old and not effective. We are aware, how important it is to provide proper water insulation for foundation walls to save them from the damaging impact of external factors. Along the front and back façades the foundation walls will be reinforced. Styrodur (kind of styrofoam) will be installed on the external foundation walls. Foundation walls will be protected with thick bituminous layer (waterproofing dispersion of asphalt – rubber substance). As it is extremely important to ensure proper ventilation for foundation walls and basement area in monumental buildings, there will be also additional, special layer installed to provide it. To create this ventilation from interior there will be ventilation ducts made (chimneys) and openable windows. Openwork internal dividing walls will give possibility to ventilate all the storerooms located in the basement. From outside between walls and the ground there will be special bucked foil installed that will give walls the possibility to “breathe”. In our building we decided to use very reliable solutions. We replaced the ceilings and reinforced the construction to create the possibility of building partition walls made of concrete blocks. Their key advantages are: extremely strong, impact and sound resistant and ability to carry large loads of suspended items. Apartments are separated from each other with the original old brick walls. Inside the apartments the internal dividing walls will be made of concrete blocks. It will provide high acoustic comfort. The internal walls will be finished with cement and lime plasters 2 cm thick painted white. This is the best material to use in old buildings because it is both resistant and also provides proper ventilation for walls. 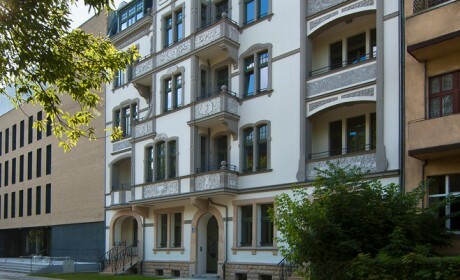 Front façade (southern side) – because of the historical decorations this façade could not be additionally heat-insulated from the outside. Therefore, we will add a layer of special heating insulation from the inside on walls which have insufficient thickness (i.e. walls of oriel and walls on attic). 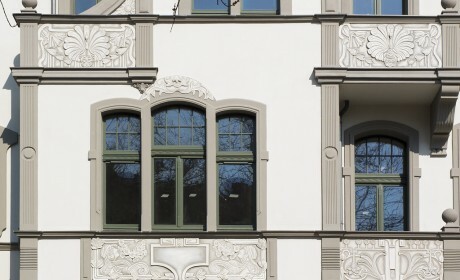 All original decorative elements will be reconstructed by experienced stucco specialists. 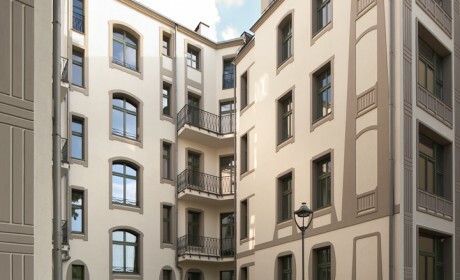 Façade will be painted with paints produced by KEIM, a company specialized in historic buildings’ facade restorations. Back façade (northern side) – whole back façades will be heat-insulated from the outside. There will be 15 cm layer of styrofoam. Also balconies will be heat-insulated. All of the existing wooden ceilings in the building will be replaced with new concrete ceilings. The new ceilings will meet current fire regulations. At the same time, permissible loadings will be the same as in brand new buildings. Each ceiling will additionally contain 8 cm styrofoam layer as sound insulation. 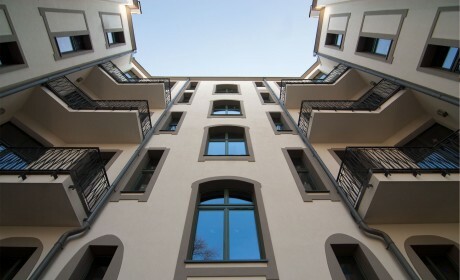 It is twice more than in typical housing, therefore the apartments will provide the maximum sound proofing. Using the additional 4 cm of styrofoam gave space to place all necessary installations without loss on acoustic and heating parameters. The whole roof structure will be replaced. Most of the roof structure will be made with new wooden beams. Wooden elements will be appropriately treated against organic corrosion before installation and also fire-protected by deep-seated impregnation. There will also be steel frames to replace most of the pillars. There is 15 cm of mineral wool layer designed to be placed inside, between construction beams; and an additional 5 cm under those beams to provide excellent heating insulation. Sloping roofs will be covered with ceramic tiles. Flat roofs will be insulated by EPDM rubber. Rain water from the building will be lead off to new drainage installation. 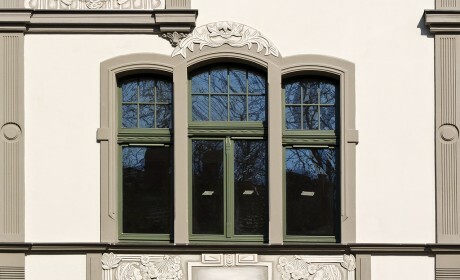 All windows will be replaced with new ones, matching the original design. New windows will be wooden and made along the lines of the original designs but with double glazing to assure high acoustic and thermal insulation. Windows on ground floor will be anti-burglary. The existing main entrance doors will be meticulously restored. New anti-burglary doors to apartments will be equipped with two locks to provide maximum security. 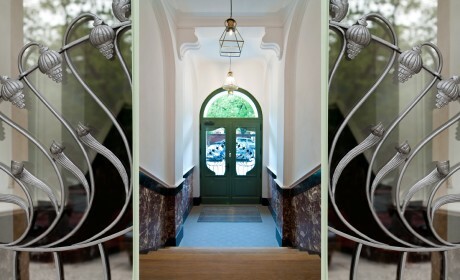 There will be decorative frames installed around the apartment doors made along the lines of the original elements. The main entrance and staircase will be thoroughly restored. All of the original stuccos will be reconstructed. Existing concrete plates covering the floor will be restored. 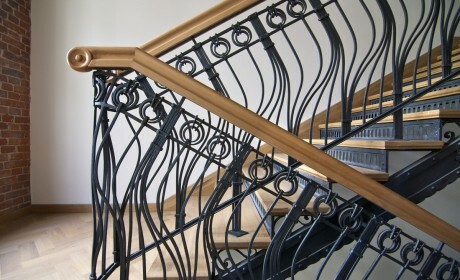 Steel staircase construction will be cleaned and fire-protected. There will be new wooden steps and wooden floors made as it was in the past. 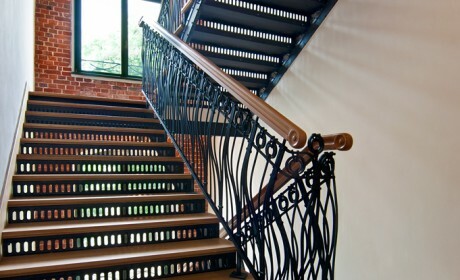 A new balustrade will connect new blacksmiths elements with original old wooden handrail. To provide comfortable communication between floors, there will be a modern, silent lift installed, without any negative impact on the stylish, classic interior design. Water and sewage installation, heating installation, and electrical installation will be replaced with new ones. Water and sewage installations will be adjusted to meet new layouts of apartments. Heating installation will be provided by city provider Fortum. New electrical installation will include lighting, electrical sockets, IT sockets and also video-entryphone installation. Each apartment will be equipped with separate water, heat and electrical meters. In apartments there will be installed radiators produced by Purmo all of which will be equipped with thermostatic heads. Marcinkowskiego 8 is a monumental residential town house located in the centre of Wroclaw in Srodmiescie district. 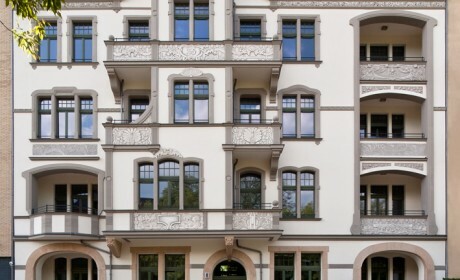 The building has undergone a thorough refurbishment which lead to its rebirth as not only an outstanding masterpiece of art nouveau architecture but also a fully comfortable place to live fitted with all necessary modern amenities.